It's been too long since I've posted but I know everyone understands that I've been busy. Reports are finished! YAHOOOOO!! I still need to add a few things here and there but they are finito. Huge waves of relief washed over me when I completed the last kid's report. I had quite the past couple of weeks. This reporting season was especially difficult for me for some reason. Other teachers felt the same. One gave me some good advice about saving my first, second and third term comments so I can use them for next year which will save me a lot of time and agony. I'll take that advice! I also suffered a cold/lost my voice last week. 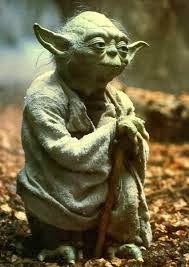 The kids said I sounded like Yoda and laughed at me. It was pretty funny to hear me, although my hubby told me to stop talking since he couldn't stand hearing it anymore! I have a lot to share with you today so be prepared! There wasn't a whole lot of stitching done until this weekend so I only have two small things to share. My Friday night SAL with Maggee has been going well. I'm nearly finished Magic Garden! I can hardly wait! 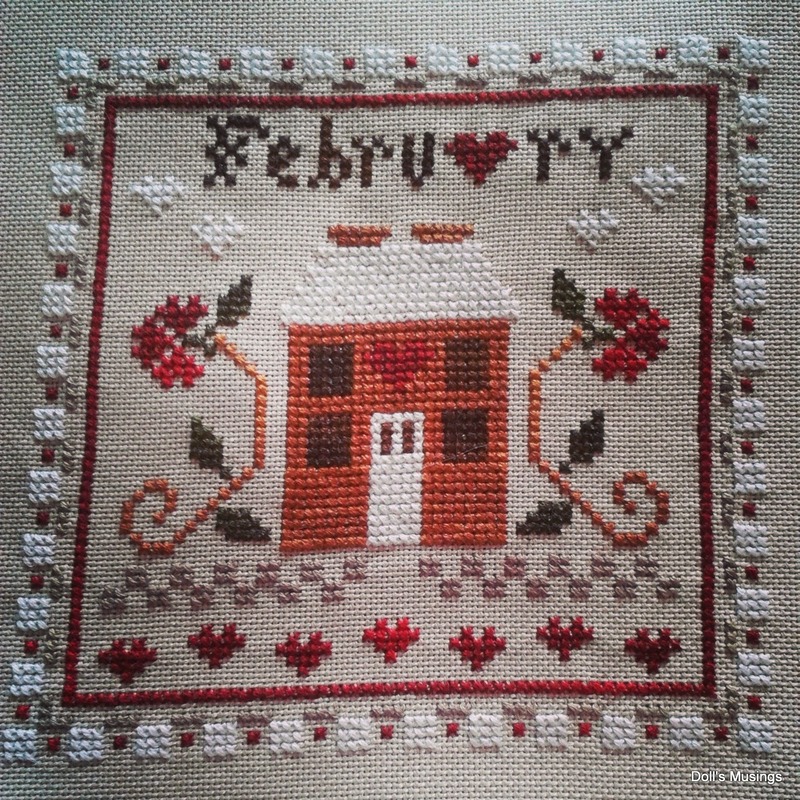 Although it's now March, I managed to finish LHN's February last night. I think I've said this before but I need to plan my stitching a bit better! I'm always late with monthly themes...stitching them after the fact! I think I'll make this into a pillow since that's the easiest finish for me. It was stitched on 28 ct. Lambswool using CC threads that dear Cindy provided in the kit. I by accident stitched the roof white but I like it! We had a lot of snow in February so it's a good reminder of the snow we've had! After leaving the peacock for awhile, I picked him up again Sunday night and tackled him. No frog came visiting me that night! Yay! Now for the best part of the post....all the wonderful packages that have been sent to me. I did a biscornu exchange with Sarah, from Sarah in Stitches and our theme was Spring. She sent mine a bit early because she has other exchanges to stitch and send out. Hopefully mine will get to her in two weeks. Anyways, she sent me the most beautifully stitched biscornu and pretty monogrammed pillow, plus some mint tea from UAE, fabric and two VMS charts. I am a lucky gal! Thank you so much Sarah for such a wonderful package!Your biscornu is so sweet and finished beautifully. It made me very happy especially after the harrowing report card experience!! Hugs to you my dear! Setting up for a photo and look who pops in and flops all over it?! Tea, chart and fabric from UAE...the tea is amazing! Sarah is such a sweet heart and I remember seeing her blog over a year ago and was one of her first few followers. It's so nice to "meet" kindred spirits from around the world!! The next surprise was from dearest Carol, Stitching Dreams. She has told me she was going to lend me a chart I'd admired on her blog, but didn't tell me she was going to send something extra!! Boy was I surprised! She made me a beautiful pillow personlized to me! She stitched a little cat in the corner and made it look like Titus. We have become quite close friends over the years and I treasure her friendship. Thank you my dear Carol! Your finishing skills are so admirable and very creative. Love those little spools of thread! I feel so spoiled by Sarah and Carol. They have truly made my week, month! I mailed out a few packages last week and hope that my recipients receive them soon. This Spring Break, which I'm itching for desperately, I hope to stitch a few more RAK's and do another mail art exchange with Meari. So looking forward to catching up with everyone too. I've been very remiss with blog commenting and posting. But that's how life is and I now you all understand. Almost forgot to show my fabric and thread toss for Sarah Chapple. I ordered it way back in January and it finally arrived. The R &R Rook 36 ct. linen is quite dark but I like it. Hubby says he wants me to keep it since it's very army like and manly. I had to laugh since the sampler is anything but manly!! I'm going to start her properly during Spring Break. I'll finish with a few photos of our late spring. 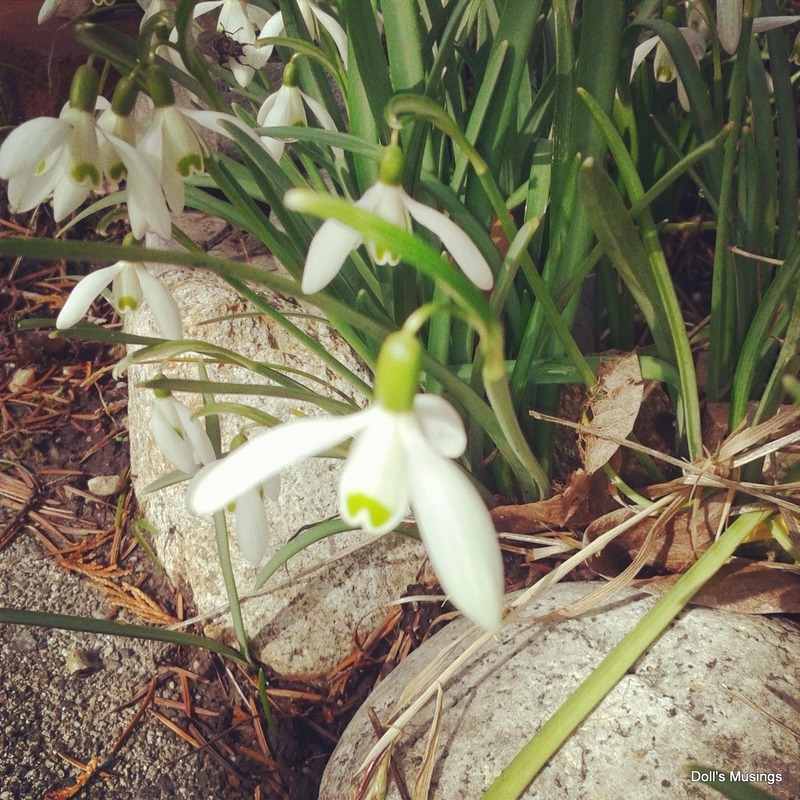 We had some snow at the end of February which set back the flowers from blooming. Now I'm starting to see some sprouting around. Can't wait for more to come! 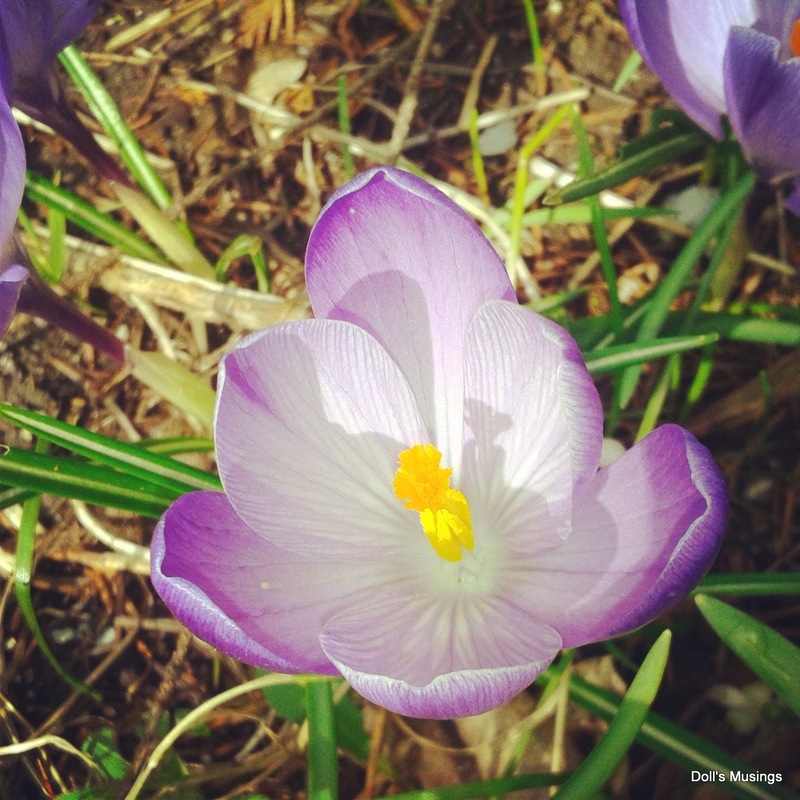 Finally I spy a crocus! That's all for now. Titus and I are going to lie down in a sun beam and relax. Loads of lovely stitching and gifties. Carol is really something special, huh? In fact all the stitchers are special now that I think of it! No dairy, no meat? All veggie? Sounds trendy and healthy! Wonderful, wonderful gifts. You really had me wondering when I saw your first post picture of Yoda. ;) My boys roll their eyes and groan with my Yoda and Wookie impersonations. tee hee! I am partly there with Lent. No meat, no chocolate, no hot chocolates or tea chai lattes(I don't drink coffee). Next year, who knows?! Your stitching is lovely, Anne. I love the Magic Garden. I have no idea how my flowers will fare this year as we still have ice and snow on the ground! You have received beautiful treasure from Carol and Sarah. Mail days are always special as are our stitching friends, aren't they? I have been away from blogging due to illness but am back in somewhat full swing. Yay! So glad you liked the goodies. Good thing I emailed you the soft copy - I didn't realize the charts got so crumpled in the mail! That's awful :( Anyway, beautiful stitching on all your WIPs, they look lovely! Wow! You have been busy. Glad the reports are finished. I remember what a chore they were. All the stitching and gifts are wonderful!! 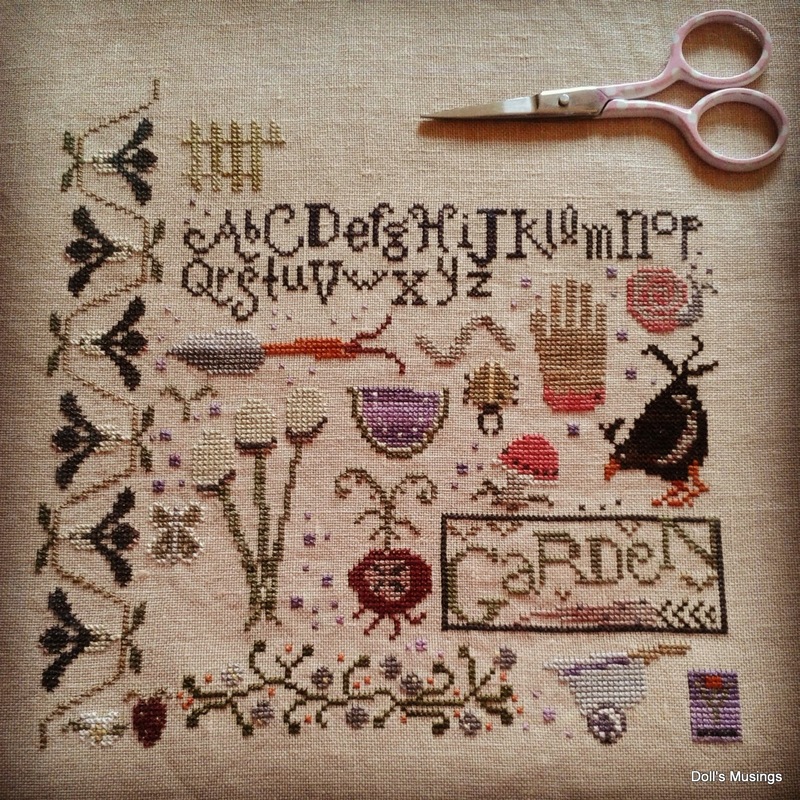 Lots of lovely stitching, Anne! Your Magic Garden is almost finished and it looks perfect for this sunny weather! Lovely exchange with Sarah but I'm so jealous over what Carol stitched for you! So perfect! Lucky girl! I have the Sarah C chart too and want to stitch her one day! Will look forward to seeing your progress! Want can I say? Gorgeous stitching, beautiful photos and what lovely gifts. Beautiful stitching, I love Magic Garden! Gorgeous gifts received, I especially love that pillow from Carol! Will follow your progress on Sarah C! Love that dark fabric! Wonderful update Anne. Everything is great. Hope you are feeling better now. Love all your stitching. Love your Sarah Chappelle floss toss and linen! LOVE! Love the flowers. I want flowers. I'm going to pout now. So many pretty photos, gifts & stitches! Love how Carol made a little Titus on your pressie. He must be pretty excited about that : ) Looking forward to your start & progress on the sampler! A big post. You have doing a lot. Great pictures. Some great gifts from some great stitchers. Lots of lovely stitching and great gifts! 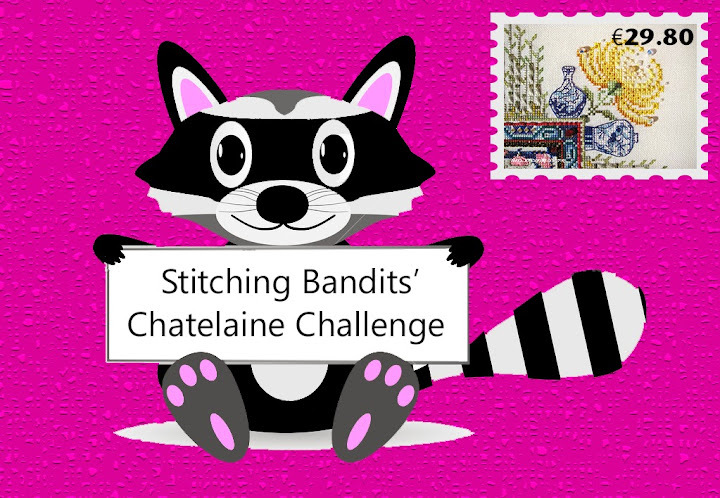 Great stitchy projects that you show here. Magic Garden is so beautiful with all its funny details. A great design. And congrats on finishing the February house. That snowy roof corresponds with real life, doesn't it. Good that there was no frogging involved when you stitched the peacock's feathers. This kind of stitching often invites the frog. I can't wait to see you start the new sampler. It will be a beautiful project. The two packages that you received are just wonderful. Look at these stitched beauties, both are very special. I hope you are feeling better by now and your voice has come back. The voice is so important for a teacher and you only realize it when you have problems to speak. I wish you a speedy recovery. Love all your WIPs, especially Magic Garden. Who is the designer? And such pretty presents you got! You know that Titus adds just that right note of handsomeness to any photo! Hope your cold is all gone now and you're back to sounding like Anne, not Yoda. Gorgeous stitching by yourself and lovely friends and your photos are also lovley especially the red berries on white snow. Love master Yoda;) Reminded me of a picture of him I had on my kitchen wall for years, which I got after I saw his departure from the The Return Of The Jedi in 1983!! I was one of many sniffling and snuffling in the cinema!! Aww...you poor little Yoda! I sure hope your voice returns to normal very soon, Anne, and that that is the end of sickness for the year. I know you must pick up every single germ that your students want to share! That is great that you're done with report card writing--I'm sure it must be exhausting. So glad you enjoyed my little gift--I enjoyed stitching it for you. Sorry my rendition of Titus isn't the best--I am NOT a designer by any means :) He is such a lovely kitty and a perfect model for your stitching. Enjoy your week, Anne--I know spring break can't come soon enough! P.S. Forgot to tell you that I got the tiny spools at a local craft store. I'll bet they sell them on Etsy, too. Wonderful things to see today at your place. I love making biscornus...fun to make. so many great pictures of very beautiful things ! and magic garden, wow ! all the gifts you received are superb ! You're not late with February, you're super-early for next year! I love the gifts you received, especially the pillow with the added Titus, so cute. Is it still a SAL if one of us finishes before the other?? You certainly will be finished before me. Been pretty sick and could not even stitch! On the road to recovery now... Great exchange and RAK you received! Stitching bloggers and friends are the best! Save those reports!! Hugs! Glad you got through report season! I can imagine it being tedious! You've gotten a lot of stitching done! Love your Magic Garden...so close to a finish! Great gifts too...that little pillow from Carol is amazing!! Lovely update Anne! Great stitching progress and what a wonderful exchange. The sweet package from Carol is wonderful. She does such beautiful stitching and finishing. A lovely post full of treasures. Super gift from Carol, I am lucky and have one of her spectacular finishes, she is such a lovely lady. Glad all the reports are finished and what great advice about saving those comments! What beautiful gifts you received. And as for those little spools of threads....too cute! I think I need to plant crocus... everyone has flowers already and our daffodils and tulips are only just now trying to peek out of the ground! Congratulations on finishing your reports. Great progress on your projects, they are looking lovely. Your stitching is beautiful! Congrats on your finish. 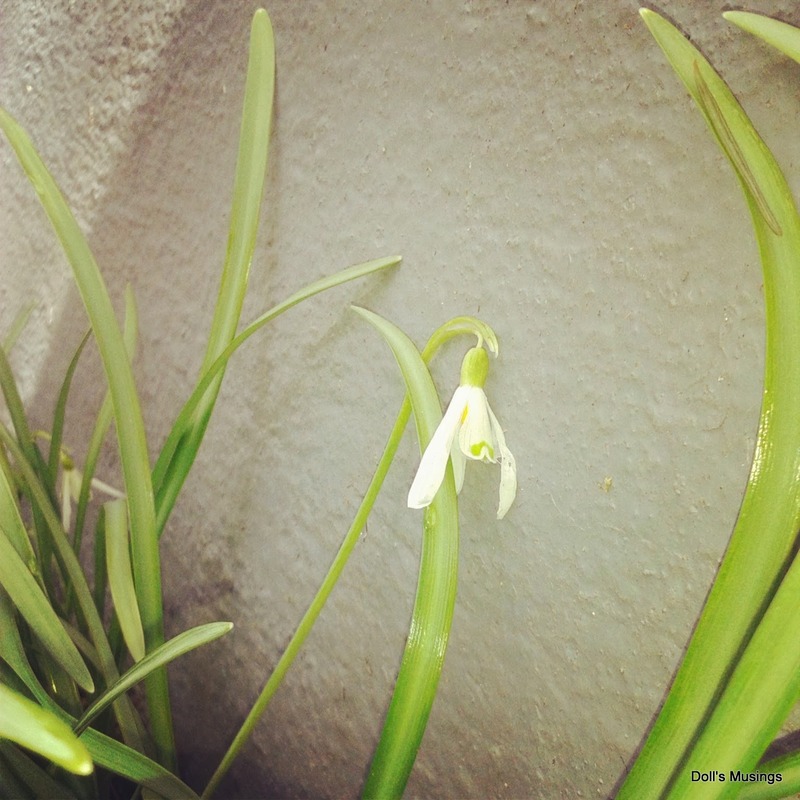 Spring is just around the corner for us also. 54F on Wed. Yay!